1832—The first church at Pleasant Green was simply an arbor covered with branches. The arbor was followed by a log building. 1843—Another log house was built, apparently from the logs of the first building. It is not clear whether it was used as a church or a schoolhouse but probably both, though it was called the old log schoolhouse when one first remembers. 1869– A frame church much larger was built, indicating considerable growth in the congregation. Inside there were three rows of benches and two “amen corners”. 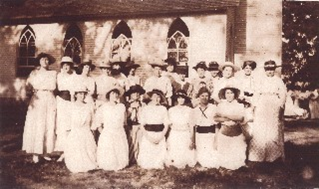 1910—A new Sanctuary was built on the same site. It was built with gifts of money, lumber and labor. The first organ was purchased at this time for $35. 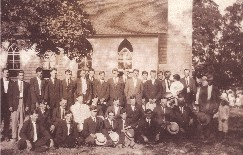 The Sanctuary was dedicated on June 30, 1912. 1939—Sunday School rooms on the right (present fellowship hall) built-in in 1939. 1962—The addition of two Sunday school rooms and bathrooms on the other side of the Sanctuary. 1981– The original Sanctuary was renovated to look exactly the way it is today with aluminum siding added. 1989– An addition was built to enlarge the Fellowship Hall and adding a kitchen, 2 bathrooms, deck and 6 Sunday School class rooms. 2003- In March of that year a new Sanctuary was dedicated. The original Sanctuary has been retained for special services and meetings.